Adamson was born on 4th April 1929 in Ashington. He played for his local club while working as a miner. He joined Burnley in 1946 and signed professional forms in January 1947, but hisplaying career was interupted by National Service and he served in the RAF. Burnley were well served by Reg Attwell and Adamson found it hard to break into the first team but when Attwell was injured he made his Burnley debut in February 1951 at the age of almost twenty-two. He finally established himself as a regular in the strong Burnley side. He made four hundred and twenty-six League appearances and scored seventeen goals for the Turf Moor team, who were his only club. He Captained the side for many years and led them to the Football League Championship in the 1959-60 season, to a losing 1962 FA Cup Final and in Europe. He was elected Footballer of the Year in 1962 but his sole representative honour was one England 'B' cap, in a 2-2 draw with Scotland 'B' at Easter Road on 11th March 1953, although he did also represent the Football League once, at Bloomfield Road Blackpool on 12th October 1960 in a 5-2 win over the Irish League. Adamson was a classy player, not blessed with great pace, but a great reader of the game with a good touch and a top passer of the ball. He was also a versatile player and dependent on who else was in the side could play equally well at right-half or centre-half although he will always be remembered by fans who saw him as a right-half in the number four shirt. He played his last game for Burnley in February 1964. He was already recognised as a top coach and was Walter Winterbottom's assistant in the 1962 World Cup in Chile and was offered the England Manager's job before Alf Ramsey but turned it down. He preferred to stay in the back room staff at Burnley and worked alongside Manager Harry Potts for a number of years before succeeding him as Manager in February 1970. At the end of that 1969-70 season he announced that Burnley would be the ‘Team of the Seventies’ but they were promptly relegated after twenty-four years at the top level. This made him unpopular with the Turf Moor fans but he survived and two years later they were back and playing the best football seen at Burnley since the Championship. They stormed to promotion with only four defeats all season and in the following season came within a point of Europe and reached the FA Cup Semi-Final. Their football was a joy to watch and the following season, despite having to sell both Martin Dobson and Geoff Nulty, they did even better and were in second place in March until a series of injuries cut short their Championship bid. Always short of money Burnley sold their best players and were relegated in 1976, but Bob Lord had already sacked Adamson before that became a reality. After a short period out of work in May 1976, he was offered and accepted the Manager’s position at Sparta Rotterdam although he later decided against the move and never reached Holland. In November 1976 he was made Manager of Sunderland, but was unable to prevent them from being relegated from the First Division. He left Sunderland in November 1978, to take over at Leeds United after Jock Stein had resigned. He built on a steady start already made by Leeds and took them to fifth spot in his first season and a place in the League Cup Semi-Finals where they narrowly fell to Southampton. It was a false dawn as Adamson sold talented players such as leading goalscorer John Hawley, Scottish InternationalFull-back Frank Gray and the charismatic and influential England International playmaker Tony Currie. His own signings Alan Curtis for £370,00 from Swansea, Brian Greenhoff for £360,000 from Manchester United, Derek Parlane for £200,000 from Rangers and Alex Sabella for £400,000 from Sheffield United, all failed to gel and after initial promise the Leeds fans voted with their feet as the gates tumbled and crowd demonsatrations ensued. Although Leeds had managed an eleventh spot in his first full season of 1979-80, the fans felt they deserved better. Adamson tried to carry on but in September 1980 he bowed to the inevitable and resigned as Leeds only won one of their first five League games and languishing in bottom spot as well as being knocked out of the League Cup at the first hurdle by Aston Villa. After Leeds he retired from the game and returned to live in Burnley with his wife May, but he left the game altogether. Turf Moor remembered him and the Jimmy Adamson Suite was opened in his honour. He died on 8th November 2011 at the age of eighty-two. • This article was amended on 9 November 2011. The original said that Adamson helped run a son's newsagent's shop after his football career had ended. This has been corrected. • Defender made 486 appearances for Clarets in one-club career • Adamson captained side to 1959-60 league title. The former Burnley captain and manager Jimmy Adamson has died at the age of 82, the Lancashire club have announced. Adamson made 486 appearances for the Clarets in a playing career spanning 17 years, placing him sixth on the club's all-time list. He will be best remembered as the ever-present captain in Burnley's 1960 league championship-winning team. "Burnley football club is sad to confirm the passing of a true club legend in Jimmy Adamson," said a statement on www.burnleyfootballclub.com. "Ashington-born Adamson gave three decades of magnificent service to the Clarets." Recruited from youth football in Northumberland, Adamson joined Burnley's groundstaff before signing a first professional contract with the Clarets in 1947, aged 17. However, he did not make his senior debut until 1951. Despite finishing on the losing side in the 1962 FA Cup Final, Adamson was named footballer of the year and, at the age of 33, was included in England's World Cup squad for the tournament in Chile that summer. Although he never won a senior international cap, Adamson acted as Walter Winterbottom's assistant during the competition and was offered the role of England manager, only to turn it down because he felt he lacked experience, leaving Alf Ramsey to take the reigns of the national team. Following his retirement in 1964, Adamson managed Burnley to promotion from the Second Division in 1973 and Leeds to qualification for the 1979-80 Uefa Cup, while he also enjoyed a spell in charge of Sunderland. It is a question which can never be answered, but it is a compelling one in any examination of Jimmy Adamson's life and work. Would England have won the World Cup in 1966 if the unobtrusive but authoritative North-easterner had accepted the invitation to become manager of the national team? After he rejected the opportunity, the job of replacing Walter Winterbottom went to Alf Ramsey instead, and the result was the most glorious triumph in the history of the English game. Footballer of the Year in 1962, Adamson was respected for his inspired long-term captaincy of Burnley and was establishing a reputation as an enterprising coach. But he had no experience of management, and it was debatable whether he possessed the ruthless drive and determination of Ramsey, who had lifted humble Ipswich Town from the old Third Division South to become unlikely League champions. Still fit and ambitious as a 33-year-old who had just missed leading the Clarets to the League and FA Cup double, Adamson was not ready to lay aside his boots. In addition, he pondered the wisdom of cutting his managerial teeth on such an onerous post – and he might not have been impressed by the cavalier manner in which his predecessor had been treated by interfering FA officials and committee members. Having travelled to the 1962 World Cup finals in Chile as coach and assistant to Winterbottom – he was expected to play, too, though that didn't happen and he retired without a cap – he had seen the media pressure faced by the manager. The job was hardly given added lustre by handsome material rewards, Winterbottom having been paid around £40 per week. Hailing from Ashington in Northumberland, the same pit village as Bobby and Jackie Charlton, Adamson was the sixth son of a miner and toiled below ground as a teenager. Spotted by a Burnley scout in a kickabout, Adamson enlisted in October 1946 and turned professional three months later. Tall and composed, he had been a school centre-half, but soon the Burnley coaches converted him into an inside-forward. But it was not until a second positional switch, to wing-half, following his return from National Service in the RAF, that he began to realise his potential, making his First Division debut in 1951. Though he was unassuming, there was an unyielding strength and lively intelligence about Adamson which marked him out as a natural leader, and soon he was captaining the Clarets, who were moulded into a solidly efficient side by manager Allan Brown. Adamson returned to centre-half, and also featured at left-half before reverting to right-half towards the end of the memorable 1959-60 campaign when small-town Burnley were battling for the League title with champions Wolverhampton, and Tottenham Hotspur. Now managed by Harry Potts, the Clarets had developed into a terrific side, industrious and well-drilled and dusted with flair, notably in the shape of the Irish playmaker Jimmy McIlroy, England winger John Connelly and the cultured Adamson. Unfashionable Burnley lifted the crown by a single point on the final day thanks to a stout rearguard action which secured victory at Manchester City. It was a phenomenal achievement, and few played a more integral part than the captain. Operating as a deep-lying midfield anchorman, he was adept at reading the game, winning the ball and using it perceptively. Though he was not a shouter of the odds he was an effective motivator and a shrewd tactician. In 1960-61 he led Burnley proudly into the European Cup, where they beat Reims of France before bowing outto Hamburg. In 1961-62 they went close to winning the double, finishing as First Division runners-up to Ipswich Town and losing to Spurs at Wembley. 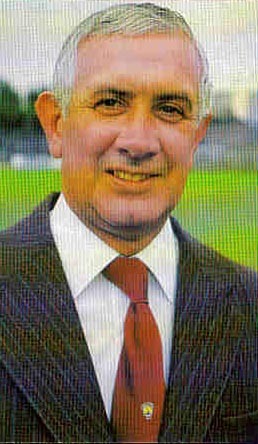 After making his decision not to take charge of England, Adamson played for two more seasons before becoming club coach in 1964 and manager in 1970. He talked enthusiastically about Burnley becoming "the team of the '70s" with such gifted young performers as Dave Thomas and Leighton James, but they were relegated. The board retained faith in him and were repaid with the Second Division title in 1972-73, and sixth place in the top flight in 1973-74. Sadly, the cash constraints which haunt most clubs of Burnley's size dictated the sale of their star player Martin Dobson and other promising rookies, and Adamson departed, disillusioned, in January 1976. There followed a fleeting spell in charge of Sparta Rotterdam before he replaced Bobby Stokoe as manager of a lacklustre Sunderland team in November 1976. He could not prevent relegation but began a reconstruction programme which resulted in a decent sixth-place Second-Division showing in 1977-78. Next, to the surprise of some, he was handed the reins of mighty Leeds United, seeking a steady hand following the rapid arrival and departure of Jock Stein. Adamson led his new charges into Europe but then came a limp Uefa Cup exit in 1979-80. Fans were disgruntled at the sale of favourites such as Tony Currie and Frank Gray, and the team became ordinary. Attendances dropped, and in October 1980 he bowed to popular demand by resigning. Though still only 51, Jimmy Adamson never returned to the professional game. It was an exit as poignant as it was premature. James Adamson, footballer and manager: born Ashington, Northumberland 4 April 1929; married May (deceased; two daughters, deceased); died 8 November 2011. Burnley Football Club is sad to confirm the passing of a true club legend in Jimmy Adamson. Adamson, a former manager and captain of the club at the peak of its powers, has died at the age of 82. Ashington-born Adamson gave three decades of magnificent service to the Clarets and is honoured at Turf Moor by a suite bearing his name, which was opened earlier this year. Recruited from East Chevington Juniors in Northumberland, Adamson joined Burnley's groundstaff before signing his first professional contract with the Clarets at the age of 17 in January, 1947. After playing in the junior and reserve teams, he made his first-team debut as a 21-year-old in February, 1951. From then on, Adamson became a fixture at right-half, and occasionally centre-half, in the Burnley team which was being moulded by Alan Brown and then Harry Potts to become the best in England. Adamson was an ever-present and captain of the team that reached its pinnacle as League Champions in 1960 and then two years later finished as runners up and losers in the FA Cup final at Wembley. Personal consolation came in the shape of his selection as the 1961/62 Footballer of the Year and, at the age of 33, Adamson was included in England's squad for the 1962 World Cup in Chile alongside Burnley team-mate John Connelly. Although he didn't win an England cap, Adamson acted as assistant manager to Walter Winterbottom for that tournament and after the resignation of Winterbottom, was offered the position of England manager. Adamson felt he lacked the experience to fill the role, with Alf Ramsey taking the job instead, and the Burnley man played on at Turf Moor until his final game in February, 1964 - his 486 appearances ranking him sixth in Burnley's all-time list of appearances. After hanging up his boots and ending the chapter of his career as one of Burnley's finest ever players, Adamson joined the Turf Moor coaching staff and in 1970 completed the succession when he replaced Potts as manager. He was to spend six years in charge and after suffering an early relegation, his 'Team of the Seventies' returned to the top flight in 1973 as Second Division champions. In early 1976, Adamson left Burnley and had spells as manager of Sunderland and Leeds United, guiding the Yorkshire club to a place in the Uefa Cup in 1979. Adamson settled back in Burnley in retirement and after a spell away from Turf Moor, made an emotional return to the club in January when the Jimmy Adamson Suite was opened in his honour. Adamson leaves five grandchildren Jennie, Katie, Sarah, James and Sam. Andrew Greaves of the Lancashire Telegraph and the newest member of the BFPA, has written a wonderful article on Jimmy Adamson who sadly passed away yesterday morning. The word legend is too often bandied about these days. But, at around 10am this morning (8th November 2011), Burnley Football Club lost one of its bona fide legends. Former captain and manager Jimmy Adamson, the last Burnley skipper to lift the Football League Championship, died at the age of 82. Born in Northumberland, Jimmy was discovered playing in his native Ashington and joined Burnley 's groundstaff before signing a first professional contract with the Clarets in 1947, aged 17. However, he did not make his senior debut until 1951. Establishing himself in the team after an appearance against Bolton Wanderers in February of that year, Adamson made himself a mainstay of the Burnley line-up for the next decade and more. An elegant player who was comfortable anyway across the backline, Adamson was the kind of player younger fans can only dream of seeing these days. He was an ever-present as Burnley won the 1959-60 Football League Championship and captained the side to the 1962 FA Cup final which they lost against Tottenham Hotspur. Despite being cup runner up in 1962, he was named Footballer of the Year, pipping his Burnley teammate Jimmy McIlroy. In a one-club career spanning 17 years, Jimmy went on to play 486 games for Burnley and is often hailed as the greatest player never to play for England. Following his retirement in 1964, he joined the coaching staff at Turf Moor and succeeded the great Harry Potts in 1970. He had previously coached the England team at the 1962 World Cup in Chile and was the Football Association's preferred choice of manager ahead of Alf Ramsey but declined the offer, thinking he was too inexperienced. His self-proclaimed "Team of the Seventies" didn’t quite live up to their billing and were relegated to the Second Division in his first full season. Jimmy led the Clarets to promotion in 1973, winning the Second Division title before a run to the FA Cup semi-finals and to win a point of a European place. He left Turf Moor in 1976 and went onto to have an ill-fated spell in Holland with Sparta Rotterdam before stints at Sunderland and Leeds United, who he lead into the UEFA Cup. Jimmy retired in October 1980 and moved back to Burnley. He returned to Turf Moor for the first time in many years in January as the club opened the Jimmy Adamson Suite in the Jimmy McIlroy Stand. Joined by his family, Jimmy was treated to one of the most heartfelt and emotional rounds of applause as he stepped out into the stand. Those old enough to have seen the great man play will cherish those memories for ever. Those too young to have done will live with the regret for just as long. A former Leeds United manager, who turned down the England job because he felt he lacked experience, has died aged 82. Jimmy Adamson was offered the chance to take charge of the nation’s football team after Walter Winterbottom resigned following England’s elimination from the 1962 World Cup. But he was still a player then and rejected the offer, allowing Sir Alf Ramsey to take the country to glory when England hosted the competition four years later. Adamson made 486 appearances for Burnley and captained the club in every game of its League Championship-winning season in 1959-60. In 1962 he was named Footballer of the Year and played in the FA Cup final, which Burnley lost 3-1 to Tottenham Hotspur. The Lancashire club, nicknamed the Clarets, paid tribute to Adamson on its website, saying: “Adamson, a former manager and captain of the club at the peak of its powers, has died at the age of 82. Recruited from youth football in Northumberland, Adamson joined Burnley’s ground staff before signing a first professional contract with the Clarets in 1947, aged 17. He made his senior debut in 1951. Although he never won an international cap, Adamson was included in the 1962 World Cup squad. He retired as a player in 1964, but went on to manage Burnley. He was in charge of Leeds from October 1978 until October 1980 and also managed Sunderland. During his time at Leeds, the club won 31 matches and qualified for the UEFA Cup in 1979. A galaxy of great names from Burnley's past turned out to say farewell to legendary Clarets skipper Jimmy Adamson this afternoon. Jimmy McIlroy, Leighton James and Martin Dobson were just three of the stars who gathered at Burnley Crematorium. But it’s a sign of the esteem in which Jimmy was held that all-time great Sir Bobby Charlton and Leeds United legend Eddie Gray also wanted to make the journey for someone who was respected across the football world. Earlier, rapturous applause broke out from lines of supporters along Harry Potts Way as the funeral cortege set off. Around 200 fans, many wearing their claret and blue scarves, bowed their heads in respect as the man who captained Burnley to the league title. As well as fans, young and old, club officials, including chairman Barry Kilby, came onto the pavement to say goodbye to the only Claret to ever win the Footballer of the Year award. Jimmy, who played 486 games for Burnley and spent 29 years at the club between 1947 and 1976, died last Tuesday at the age of 82. The service was a private affair, attended by friends and family, including his five grandchildren, Jenny, Katie, Sarah, James and Sam. His former players including current chief executive Paul Fletcher, Stan Ternent, Colin Waldron, Peter Noble and Leeds United’s Eddie Gray also attended the service. In total around 70 people attended the service, which lasted around an hour. The first hymn sung was Jerusalem, before the Rev Roger Parker, of St Catherine’s Church, led the tributes to Jimmy. He said: “We come here today to say thank you to almighty God for someone who was literally a legend in their own lifetime. “We also come to say thank you to God for someone who was a private man and a wonderful husband, father and grandfather. “Jimmy was somebody who enriched countless lives.” Martin Dobson and Paul Fletcher then paid tribute to their former manager. Mr Dobson, who was appointed captain when Jimmy took over as manager in 1970, said: “Jimmy was one of Burnley’s greatest ever servants, he instilled in us what it meant to play for Burnley. “It is a pity I can’t thank him one more time for everything he did for me, but I am sure he is already organising a five-a-side game up there.” Mr Fletcher, who was Jimmy’s record signing when he arrived from Bolton in 1971, said: “I visited Jimmy on Christmas Eve in 1976 and have visited him every Christmas Eve for the past 35 years and we would talk about the same things every year. “Over the years he became quite bitter about Burnley, he didn’t seem to realise the supporters held him in such high esteem. “I am forever grateful to Jimmy, he was a wonderful manager and a wonderful man, and I hope his grandchildren realise what a significant part he played in the history of this town. “For me he is in the top five people who have made a difference to this town.” Fans echoed the feelings of the former Clarets greats by calling Jimmy a 'true legend'. Phil Gibson, 29, said: “I wanted to come to pay my last respects to a true legend. I never saw him play but you hear stories about how great he was and what a great man he was.” Tony Dickinson, 61, said: “It is a shame it took him so long to get back to the club after he left, but he realised that day how much he was loved here.” John Withington, who painted his face and head in the Claret colours with the text 1929-2011 in honour of Jimmy, said: “Everybody at Burnley loves him, he was a magnificent servant to the club. He will never be forgotten.” Roy Holtom, 65, said: “He was the most wonderful footballer that this club has ever known. “You can’t overestimate the influence he had on Burnley. "The term legend is bandied aboud too often these days, but Jimmy Adamson is definitely a Burnley legend. “He was a magnificent man and it is a privilege to be able to pay respects to somebody who did so much for this club.” Sheila Rogers, 67, said: “He was the best centre-back we have ever had and one of the best players we have ever had. “Not only that but he was also a gentleman.” Gordon Rogers, 69, said: “He was a great servant and a great ambassador for Burnley, that is why is so many people turned up to say one final goodbye. “It was a shame he never really came back for so many years. I don’t think he ever wanted to leave Burnley, his heart was here.” As mourners left the crematorium the Geordie folk song Blaydon Races played out, considered the unofficial anthem of Jimmy’s beloved Tyneside and an iconic football chant. A fitting way to say goodbye to a man who will never be forgotten at Turf Moor.